Home» ts old gos | TS ST Scholarship G.O's » TS G.O.NO: 13 ST Students Pre-matric Scholarships scheme under the Best Available Schools. TS G.O.NO: 13 ST Students Pre-matric Scholarships scheme under the Best Available Schools. 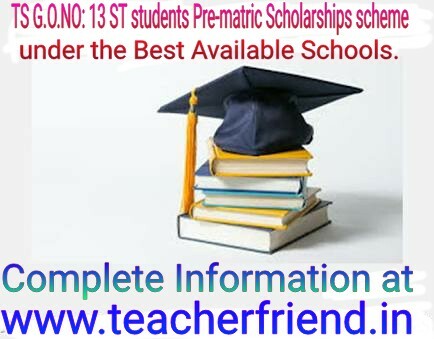 Telangana Pre-matric Scholarships Increase in ST students under the Best Available Schools Scheme –District-wise allotment of seats – Orders as pare G.O.No: 13 ; Telangana Pre-matric Scholarships Increase in ST students under the Best Available Schools ; TS ST students Pre-matric Scholarships scheme under the Best Available Schools as per G.O.NO: 13. Telangana Tribal Welfare Department – Tribal Sub Plan 2015-16 – Pre-matric Scholarships – Increase in the intake of ST students under the Best Available Schools Scheme –District-wise allotment of seats – Order. students under the Best Available Scheme by 1800 seats during the year 2015-156.
to (6000) instead of (4271) including renewals. a)There shall be an increase of 1729 seats for sanctioning of pre-matric scholarship for Scheduled Tribe students studying in the Best Available Schools and the sanction of scholarships shall be as per the procedure ordered by Government vide G.O.Ms.No.70, Social Welfare (TW Edn.II) Department, dated 01.08.2001, except that the mode of selection of students shall be by way of drawing lots. 10% of the total seats i.e. 173 seats shall be allotted to the scheduled areas in addition to their normal entitlement as per the population proportion since the AP SCSP and TSP Act, 2013 at Section 6 envisages that “In case of Tribal Sub Plan, special attention shall be paid to Scheduled Tribes residing in the Scheduled Areas”. Further, in addition to the above another 10% of the total seats i.e. 173 seats shall be allotted to the ST students belonging to PvTGs (PTGs) communities based on the proportion of their population to district population in view of the low levels of literacy of the PvTGs (PTGs) communities and since the AP SCSP and TSP Act, 2013 at Section. 6 envisages “to promote equity in development among various social groups within Scheduled Tribes”. The remaining 80% of the total seats 1383 seats shall be distributed among all the 10 districts as per the population of STs of the districts to the total ST population of the State as per 2011 census after transfer of certain villages of Khammam District to A.P and allocation of the total seats (6000) as shown at Annexure. And the entry point for filling up of these vacancies is at Class III in addition to Class V and VIII in the ration of 50% , 25%, & 25% for III, V & VIII respectively. From 2016-17 onwards, the vacancies that arise consequent to children passing out X class or due to admission into other institutions shall also be filled up by students belonging to the same tribal group only. 3.Further the District Level Committees as constituted vide G.O.Ms.No.70, Social Welfare (TW.Edn. II) Department, Dated 01-08-2001 for implementing the scheme shall distribute the seats allocated to the districts from among the mandals and among various tribes based on their population to the total district ST population to ensure equitable distribution of the opportunity. Detailed guidelines and formats shall be issued by Commissioner, Tribal Welfare in this regard. 4.The expenditure towards sanctioning the pre-matric scholarships to the ST students admitted under this allocation shall be debited to the following head of account since adequate provision has been made for the proposed additional intake of 2,300 seats under the scheme. 5.The Commissioner of Tribal Welfare, Telangana State, Hyderabad is requested to meet the additional amount of Rs. 1.00 Crores from overall TSP funds. 6.The Commissioner of Tribal Welfare, Telangana, Hyderabad shall take necessary action accordingly. 7.This order issues with the concurrence of the Finance (EBS.III) Department vide their U.O.No.6227/290/A1/EBS.III/2015, Dated: 16.6.2015.